Imagine a world where paralysis is considered to be a short-term condition; where those suffering from Parkinson’s disease or other neurological conditions can be treated, and where people suffering nerve damage can feel the heat from a freshly made cup of tea, or the texture of the ground underneath their feet. To date, CSNE has worked on projects connecting into the brain and nervous system but this venture represents the first time there has been any real attempt to work on the closed loop feedback system between the cortex of the brain and the spinal cord, Peter Ferguson, Director of Healthcare Technologies at ARM, explains over the phone from Seattle. So why hasn’t this been tried before? As one would expect, implanting a chip into an individual’s brain brings with it a whole host of ethical and biological challenges. It’s that second challenge that made finding the right partner so fundamental to this entire project. ARM is already a market leader, designing low powered chips which are then licensed and manufactured by other people to be used in 99% of mobile phones and smart devices. ARM’s credentials for this project were obvious however, the question remained: How can you migrate the ability to compute using mobile phones into something that can compute within your brain? According to Ferguson, the answer appears to lie with ARM Cortex-M0 processor, a chip efficient enough to combine the low power ARM technology with a sensible frequency and voltage design whilst being small enough to enable the necessary level of embedded control within the brain. 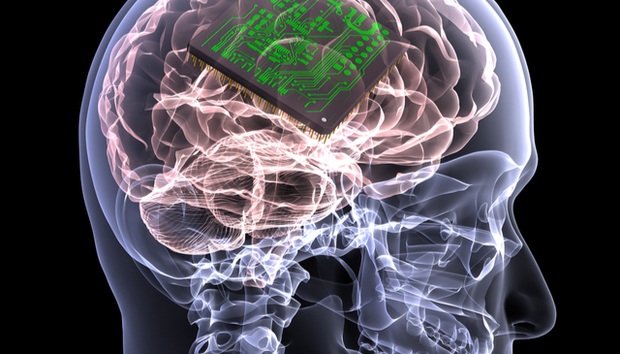 Whilst the development of this ‘brain-implantable’ chip is still in its infancy of the 10-year timeline, technology and healthcare services have increasingly come together in an attempt to improve patient care. Ferguson makes it clear that this increasing shift towards digitising aspects of health care is no bad thing; with the emergence of smart devices and technologies such as patches that can be applied to the body to measure smells associated with cancer or listen to your chest to detect symptoms of asthma. Whilst the technology itself is undoubtedly exciting, the potential industry-wide benefits it could provide healthcare services with are just as ground breaking. Take a phone case that doubles as an ECG monitor, for example. The data it can provide is fascinating but, not only can it be used to keep an eye on your health, it could pick up any abnormalities and uncover an undiagnosed condition that could have caused complications in later life. “Reading your ECG is invaluable and the more powerful the compute models included in the technology, the more these devices can move from being data collectors into knowledge collectors; comparing your signals with what normal is or what normal was for you yesterday or what normal is for your height and weight. The more meaning you can gain from the data and the greater the context for the data when you present it to clinicians, the better they’ll be able to work out what’s going on and what medication is most appropriate for your health. The future of healthcare and technology is clearly so intertwined, enquiring what the future could hold seems so impossibly open-ended it feels almost stupid to ask. Feeling too hot or too cold and automatically adjusting the thermostat, for example. ARM Holdings is based in Cambridge and with this thought in mind, Ranjan ends the conversation with an homage to Stephen Hawking.